Soft power has tended to be overlooked in the field of international relations, often dismissed as lacking relevance or robustness as a theoretical concept. This book seeks to expand upon the idea of ‘soft power’ in international relations and to investigate how it actually functions by looking at three case studies in Japan-China relations during the post-war period. These cases involve the action of Japan’s soft power in China due to the activities of agents at three levels in society: the state level (an agency of the central government), the sub-state level (a local government), and at the non-state level (a non-governmental organisation). In addition, a major theme of the book is to examine the role of important international actors whose roles are not covered sufficiently in international relations discourse. 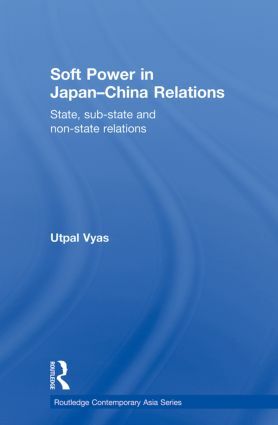 Utpal Vyas demonstrates ways in which soft power is a useful analytical tool to understand relations between China and Japan in the early 2000s. The case studies help to reveal the complexities of interaction between China and Japan beyond the usual state-level analyses and offer a valuable resource for the study of Sino-Japanese relations and IR in general. This book will be of interest to academics and postgraduate students in Japanese studies, Chinese studies and International Relations. Utpal Vyas is Assistant Professor at Ritsumeikan Asia Pacific University, Japan.